A lack of energy is one of the most common complaints among my nutrition clients. energy drinks and others stimulants to improve their energy. One of the most common things people do to improve their energy is turn to foods that are high in caffeine (like coffee) or sugar (like a muffin). Caffeine and sugar are stimulants that may initially work to spike your energy, but eventually leave you feeling completely exhausted. Why? Because stimulants spike the blood sugar, causing the pancreas to dump too much insulin into the bloodstream and drastically lower the blood sugar, which inevitably makes us feel tired. Try this: Go to bed early and get 7.5 hours of sleep a night – regularly! A tired brain craves sugar and is compelled towards a large coffee in the morning to make it through the day. A well-rested brain doesn’t crave sugar, and can more easily avoid the temptation of a morning brew. So make your sleep a priority. Try this: Eat whole grains that haven’t been stripped of their B vitamin content (whole wheat, brown rice, oats etc.) 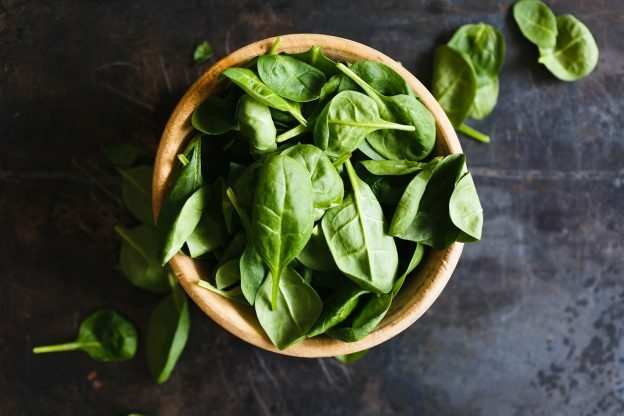 and dark leafy greens that are super high in B vitamins as well. Kale, spinach, gai lan and chard are all great options. Be sure to just lightly cook these veggies in order to preserve their vitamin content. Also, nutritional yeast is high in B vitamins as well! It has a nutty, cheesy flavour so works great to sprinkle on a salad, dip or kale chips. Much like stimulants can lead to low blood sugar (and therefore fatigue), so too can skipping meals. When our blood sugar is low, we can crave high carb foods that will send us on a blood sugar and energy roller coasted ride. Try this: Keep snacks on hand at all times like boiled eggs, raw nuts and seeds, veggies and dip, and yoghurt and fruit, so that you’re not skipping meals while you’re on the road, and are less-inclined to stop at a coffee shop for a high sugar option. Include a protein at each meal to further help to balance blood sugar, so include a protein like eggs, wild fish, nut butters, beans, lentils or organic tofu as often as possible. 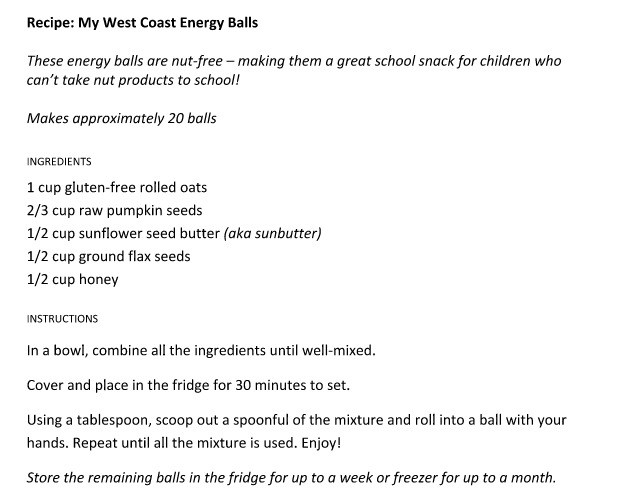 Adding a vegetable-based protein powder (hemp or pea protein) to a smoothie is a great option as well, or making energy balls that will delight the entire family (see recipe below). yourself up for a successful, energetic day tomorrow. This entry was posted in energy, food, health, Tips, Vitamin B on October 1, 2017 by Tasreen Alibhai.